Oh man, do we love dates. Not the delicious snacks (although we do love them), nor the act of nervously meeting someone and losing all your SENSE oF VOLUme CONTROL (though we also love doing that ). But right now we are talking about the idea of turning each individual day into a special occasion. Sometimes, we celebrate an annual tradition; other times, we just arbitrarily find an excuse to make a day into a day of action. 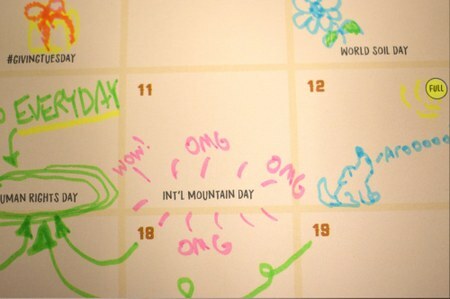 Did you know yesterday, 12/11, was International Mountain Day? Or that 12/10 was Human Rights Day? For all of us, these should be every day prompts, but sometimes it’s a nice reminder to make the effort to take care of our planet; or to hold the rights and every human out wandering about on this earth with respect and dignity; or if nothing else, then a reminder that today is a great day to do something extraordinary. 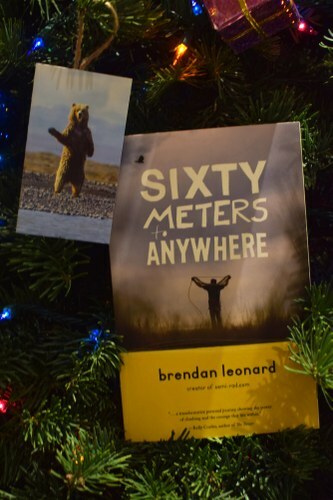 While we have an international audience, we here at Mountaineers Books are rooted in lovely Seattle, Washington. We started as – and still are – a group of locals who love to wander around when we can. 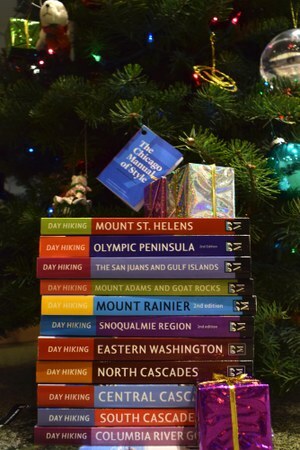 No surprise, then, that our Day Hiking series is stacked in the picture with 11 Washington titles. 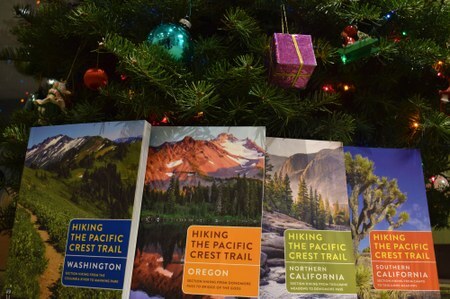 These little guidebooks pack a big wallop, and when you get a stack of them like this, that's info on thousands of miles of trails. Yes, “why didn’t you just do the 10 Essentials instead?” That would be thematically better. Yes, we are cheating the numbers a little here. 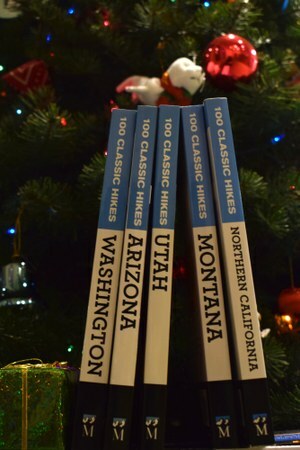 But of course we have to reference these state-wide hiking guides. It’s like someone (in this case, an author) went out, hiked all over the state, took meticulous notes, verified the hikes again, conveniently put it all into a single guide –and now you are looking at Hidden Lake and it’s the most beautiful thing you’ve ever seen and everything is perfect because you knew ahead of time what routes to take and how to safely get there. See? Worth the fudging of numbers a little. If, for whatever reason, you don’t know what to get that someone who enjoys the outdoors, you'll never go far wrong with “Freedom 9” . This is the go-to mountaineering book for new and intermediate climbers, with contributions from major climbing organizations to develop a comprehensive, standardized set of instructions. 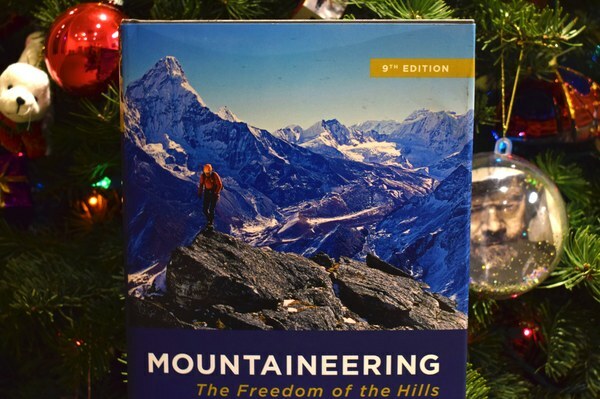 With this book, you have over 50 years of publishing history; careful editing from experienced climbers and instructors; and contributions from experts in the field. Plus, that Jimmy Chin cover photo alone will warm any mountaineer’s cold (and hungry. And tired. Maybe oxygen-deprived) heart. What John Muir set for public perception, then, was that the wilderness – dangerous as it may be – is also a place of unsurpassed beauty. Muir explored, noted, sketched, and recorded in all sorts of manners his wilderness explorations, and his resulting books were instrumental in setting forth the way to establishing protected lands in the US (and abroad). 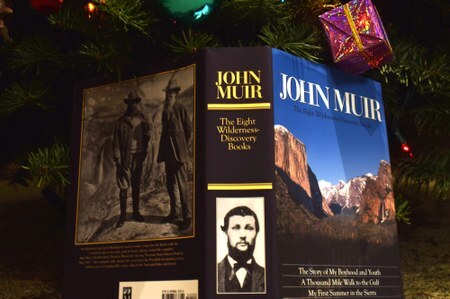 Muir’s Eight Wilderness Discovery Books is a collection of some of his most influential writings as he explored America’s wild lands. Appreciating nature and the wilderness includes making the outdoors accessible. That outdoors ethos – are public lands truly public? Or only for those who can afford it? – is at the heart of what makes Urban Trails unique for us. 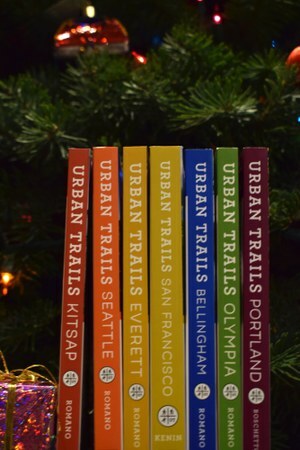 For the folks who want to head out, but can’t find the time or resources to spend hours upon hours on the just getting there, the Urban Trails series is all about finding what’s close to you. Or, at least, close to you if you are around the seven cities we have so far. Brendan Leonard is a funny guy. Here: proof. But how did the man behind the pie charts, venn diagrams, and line graphs (trust me, more exciting than it sounds) get started? His story starts out dark – “rock bottom” – and we slowly watch Brendan piece together his life from what may seem like a out-of-place gift: climbing rope, from his brother. The holidays are a time for joy, but for those who has experienced it, it can also be a time that’s especially tough for people struggling. Everyone’s a little different, but if it’s appropriate, a little nice catch-up can go a long ways for someone you’ve been meaning to reach out. Blog premises aside, we truly are proud of the amazing work our authors, photographers, illustrators, essayists, and all the people behind the scenes put into each book. 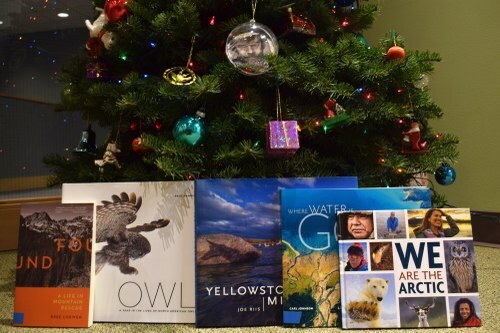 It is always a warm feeling when their hard work is recognized, and that the message we want to send as an independent, not-for-profit publisher goes into each title. Had we any true musical production, there would be an interlude now where we’d slip in a version of that The Proclaimers’ song, except we'd go along the lines of “I’d Walk 2650 miles along the PCT, and another 2650 more on the way back.” But 5300 miles is a pretty long round trip on foot. Fortunately, you can break the PCT down into sections, and that’s what these four books – themselves divided by state, with California further into northern and southern parts – set out to achieve. 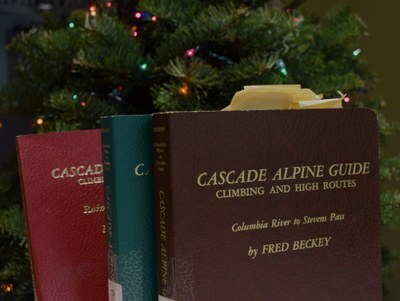 Every so often, we get an email that goes something like this: “I’ve been using Cascade Alpine Guide, and it’s the best!” or “Beckey’s Cascade Alpine Guide changed my life!” It’s the one series that people just can’t help but love. Pictured are the archival first edition copies of this beloved series from our library. And hey, if you are heading out into the Cascades, be sure to pick up Staying Alive in Avalanche Terrain, 3rd edition as well! We want you all to stay safe out there, and the jagged, rugged Cascades is one place to not mess around. Pictured is all three editions -- check out the super 90's font when Staying Alive first came out! 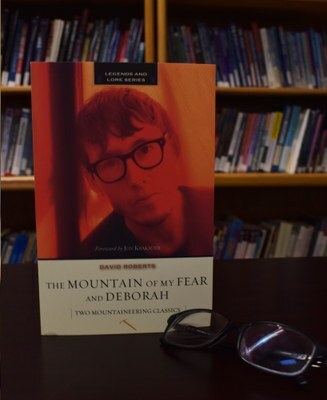 You may have heard of David Roberts from his many beloved books and popular columns – but these two books inducted in our Legends and Lore series were the very first books he wrote, when he was a Harvard undergraduate. Let’s kick this off with an ode to sustainable sustenance. 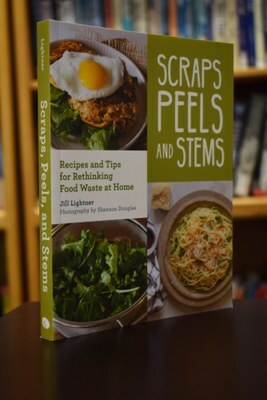 Jill Lightner’s Scraps, Peels, and Stems could not have come at a better time, with amazing meals resulting in mountains of food scraps. But instead of having all that going to waste or preparing for Endless Turkey Sandwich Armageddon, treat yourself to more creative options and potentials using turkey leftovers (soup stock), veggie scraps (Jambalaya), and pear cores (cider). I love all of this post--and not just because I successfully predicted (to myself) what day #12 would be. So many favorite titles, several of which, by gum!, I have given as gifts in years past. 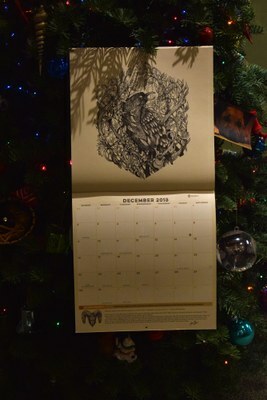 And some new ones to give this year.